The fall season is full upon us, with leaves glowing and blowing through the yard. Not but a month ago, the spaces now claimed by fallen leaves were occupied by sunning succulents, sucking up the last of our sunny summer weather. 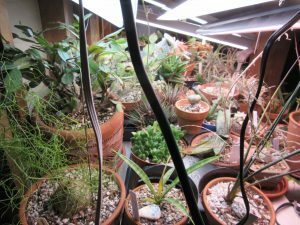 With the collections buttoned into greenhouses, moved onto window sills, and into basements under bright LEDs, our succulents transition into their winter rest. While tucking all the plants into the nooks and crannies available for winter, it’s a good time to take stock of plant health and growth through the summer. Many plants made big strides this year with our hot sunny weather. It was merely a matter of keeping up with watering. That’s something we don’t say often in the rainy Pacific Northwest! 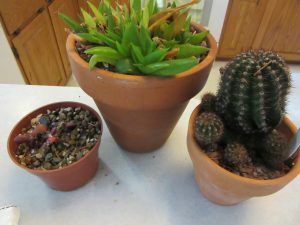 A bit of mealybug was noted in a few plants, which have now been moved to “Urgent Care” on the kitchen counter. Here they get constant vigilant attention and needed spritzing with rubbing alcohol. Our club is also wrapping up a very successful year of programs and field trips. We are enjoying an influx of new members brought about by our recent club sale. Already they have contributed ideas for programming and offered assistance with some of the ongoing club needs. This time of year our club elects new officers to carry us through the coming year and hopefully years. It takes a few months to get one’s stride as a newly elected club official, so expanding service to the club for a couple of years allows for more depth to develop in leadership. Generally the focus for the change in leadership in our club, is on the office of president. This all important person at the helm who provides support to volunteers working on special projects, who maintains the constancy of our club, who makes connections to other cactus and succulent communities, and who sets our vision is usually hard to find. Finding those willing to serve in the role of president is a challenge and even more so finding one who is visionary and possessing needed leadership skills. While the president is carrying the vision and structure of the club there are many worker bee roles needing responsible volunteers – refreshments, name tags, room set up and tear down, A/V, field trip coordinators, mini presenters for Cactus and Succulent of the month. These are the people who pitch in on a regular basis to make sure the meeting room is comfortable and the small parts happen to make the whole. Still a bit difficult to secure these people in ongoing roles but we are seeing more step up to take on the smaller jobs. Our club is strong, energetic and fun. It would not be this way without our able and willing volunteers. We hope for some new volunteer energy in 2019 to carry us forward. But for now, we are in good shape and looking forward to our next two meetings.